We offer a wide selection of Carports, which are suitable for most of our customers. 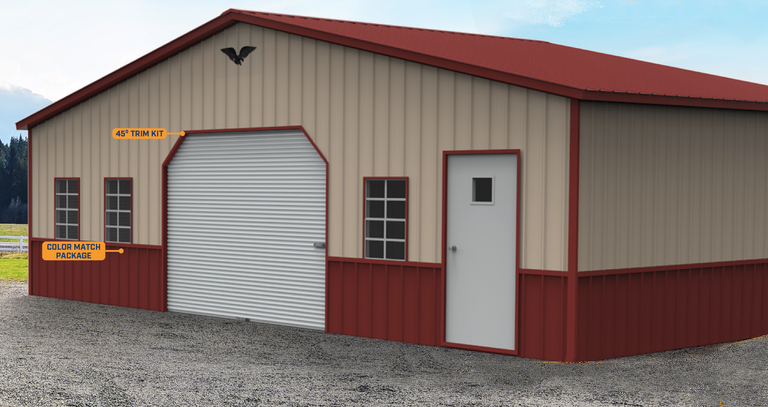 We can also create these custom buildings from 32 to 40 feet wide and as long as needed. All of our commercial grade clear span buildings come standard with vertical roofs. They also have optional vertical siding and ends. We offer them in both a 14 or 12 gauge framing. We also offer a variety of options with our carports. On both the standard type and the A-frame type, the carport comes with a Standard Horizontal Roof. The roof panels run parallel to the side of the carport. With our A-frame with Boxed Eave products, you can choose to have the panels installed vertically at an additional charge. You should consider purchasing additional panels to the side of your carport to keep the blowing rain off of your vehicles or equipment. Also consider the addition of gable ends to your carport, especially if you are placing the carport near your home. It makes the carport stronger and it has a much nicer curb appeal.